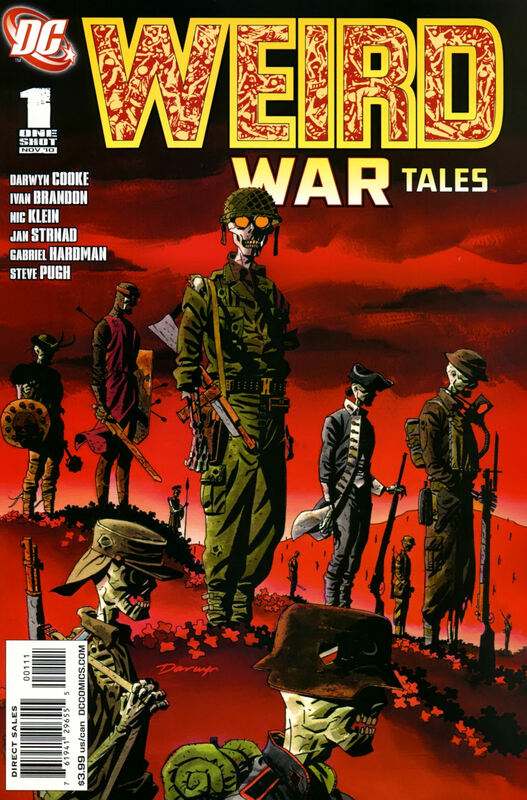 Confessions of a Comics Shop Junkie: Mort Meskin bio, Weird War Tales #1, more. Here we go again with Confessions of a Comics Shop Junkie, that more-or-less weekly feature in which I opine on various recently released publications of the sequential graphic nature, some of which may be sitting on the rack at a comics shop, or awaiting the click of a button on some online merchant’s web page, near you. If you’re lucky. Or not, as the case may be. 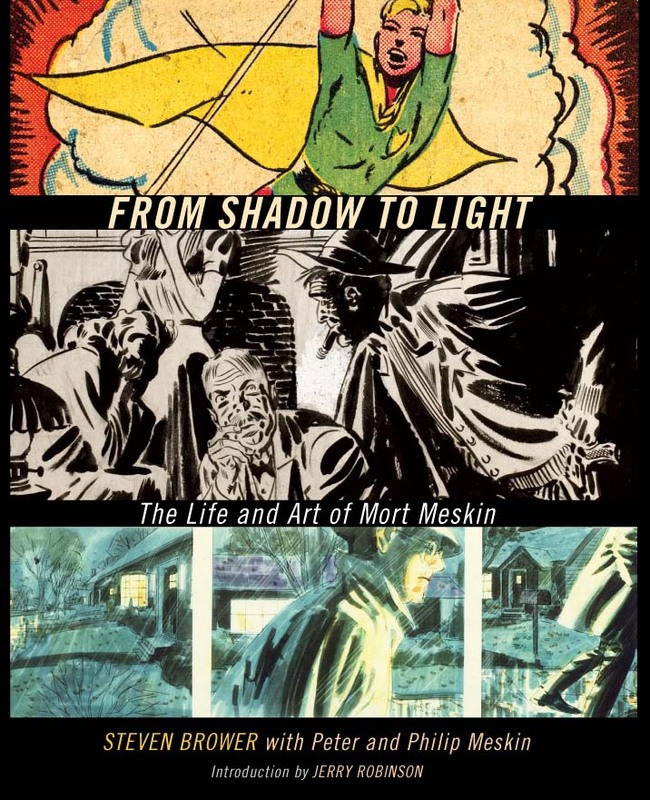 Well, if nothing else 2010 may be shaping up to be the Year of the Overlooked-Illustrator Biography; along with Blake Bell’s outstanding look at Bill Everett, we now have this overview of the life and career of one of Everett’s contemporaries, Morton Meskin. I saw Meskin’s work a lot as a little kid, looking at old issues of the fantasy comics stuff like DC’s House of Secrets; it didn’t make a strong impression on me. He wasn’t even credited sometimes, which wasn’t unusual back in those days. A few years later, however, when DC started putting out those 100 page Super Spectaculars in the early-mid 70’s, and filling them up with Golden Age reprints, some of the most memorable of these were stories of the Vigilante and Johnny Quick…drawn by Meskin. His style was very different in those days, though, like night and day- looser, rangier, with skilled use of shadows and highlights and some wonderfully dynamic dramatics, especially on each story’s splash page, reminiscent of the ones Will Eisner did on The Spirit at roughly the same time- indeed, Meskin worked at Eisner/Iger Studios for a while. I loved those reprints. By contrast, his 60’s work was stiffer, more conventional and staid, and had none of the life and spark of his Forties and early Fifties stuff. For a long time I didn’t make the connection between the two styles, until many years later when I began to read a little here and there about the man’s work. If this book had been around back then, I would have understood a lot sooner; it does a thorough job of covering all aspects of his life and career, from his birth and early life on through working for just about every major comics publisher in New York, his later career in advertising, and his eventual health issues, both physical and mental. We get a good look, through a lot of first-hand accounts by people like lifelong friend Jerry Robinson, at his shy and reserved personality, and how the stress of trying to make a living in the industry cost him. This book does a marvelous job of describing and creating the atmosphere of what it was like to be trying to make a living in comics during the Forties and Fifties, and getting across the camaraderie the artists and writers had with each other, in a different time, especially from today. That said, it often seems like Mort’s too good to be true sometimes; rarely does anyone have anything to say about Meskin that’s negative, and that sometimes gets distracting, but I suppose the decision early on was made to celebrate the man and not provide a warts-and-all type portrait. His sons have had a lot of input, and with their up-and-down childhood (they spent time in a foster home after their parents divorced and Meskin was recovering from a nervous breakdown, and never did really have that stable sort of home life again after that), you’d think there would be some Christina Crawford-type axes to grind, but that seems to have not been the case. The man truly does seem to have been universally admired, respected, and loved, and managed to maintain a strong and positive relationship with his sons even after remarrying later on, to a woman that is, as she’s described anyway, an apparent godsend to him in his later years. At least that’s the impression I get from this book. It also comes across that he was not respected or all that appreciated, by and large, by the decision makers at DC at the time, and he adapted his art approach to try to come closer to what was perceived as their house style, which explains the difference in his stuff then and in years past. Since this is, after all, a book about an artist and not a celebrity tell-all, this volume is lavishly illustrated as well, with many of those gorgeous splash pages I mentioned along with covers and complete stories from all stages of his career, including a lot of what he did while employed by Eisner and Iger and Joe Simon and Jack Kirby (he and Kirby had a strong mutual respect, and competed to see who could draw the most pages in a given time) as well as his later DC years. A lot of his surprisingly outstanding sketches and doodles are reproduced as well; his was a busy and restless talent, and he was always experimenting and putting things on paper, quite often because he was bored in his advertising work, being used to the punishing deadlines of the comics business before. Scripts: Darwyn Cooke, Ivan Brandon, Jan Strnad; Art: Cooke, Nic Klein, Gabriel Hardman, Steve Pugh. Three-story collection, the main attraction being Cooke, I suppose, though Hardman has been making a name for himself lately over at Marvel on titles like Atlas and Strnad has some currency with readers of a certain age. Cooke doesn’t disappoint, not really; his lead story, an fanciful account of the cadavers of notable legendary wartime figures like Joan of Arc, Robert E. Lee, Winston Churchill, Rommel, Genghis Khan, etc., getting together annually as if in some sort of Civil War re-enactment slash outdoor festival to party, hang out, and fight each other, is slight but it’s done with a light touch and the ending elicits a chuckle if you’re inclined to be able to laugh at the historical figure that appears at the end (trying hard not to spoil, OK?). Cooke’s art style is one of two things: either sketchy and loose and dashed-off because he batted this out as a throwaway between working on Parker pages, or he’s attempting to refine and streamline his style a la Mignola (and this will remind you quite a bit of Mignola in places). Either way, fine- though I prefer a more fleshed-out, no pun intended, Cooke art experience. I wish Cooke hadn’t seen fit to use every font on his desktop, though, in his attempts to give the characters a bit more personality, he uses some typefaces in his word balloons that make the graphic designer in me cringe. I mean Lucida Calligraphy? Sand? Yeesh. Dave Stewart more than makes up for it with some gorgeous color, all deeply saturated reds and golds and browns, reinforcing his status as one of the very best colorists in the business. The other two stories are well done, but nothing special; in the 70’s, they would have been nice fillers in the ongoing Weird War Tales of the period. Brandon and Klein’s account of a WWII submarine crew that winds up marooned on the ocean floor after a battle works well but is saddled with an inconclusive and somewhat predictable ending. Strnad and Hardman’s account of two soldiers who were childhood buddies, one gravely wounded, hiding from zee Germans in an old church, works in some pathos with its evocation of the dying pal’s love of dinosaurs. Yeah, dinosaurs- that’s why it’s “weird”, OK? Anyway, this is worth a look if you’re a Cooke fan, and the other two stories aren’t so bad that you’ll think you blew your four bucks…so proceed accordingly. The Year of the Dabbling Celebrity Comics Writer continues, as a True Blood actor is writing the script, or at least he’s credited for it. 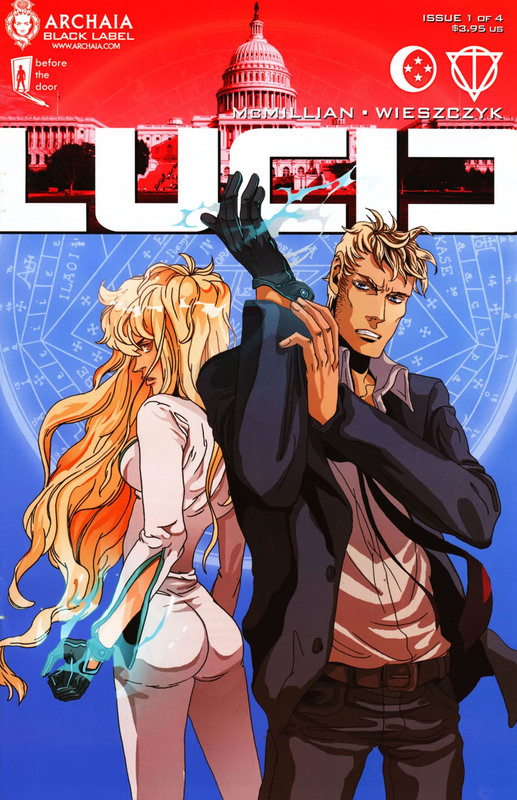 I have to tell you straight up that I don’t know exactly what it was that caught my eye about this comic, and no, I’m not a True Blood viewer; I suppose I was just looking for something brand new that I hadn’t written about before, and this looked mildly intriguing with its sky blue and bright red color scheme and vaguely hip manga-style characters on the cover . So I dove in, not really knowing what to expect, since I hadn’t heard of either creator at all (just found out about the writer’s day job while researching this after the fact). I’m pleased to report that I was pleasantly surprised; its “government sanctioned supernatural secret agents slash defenders” concept is not the most original thing under the sun, but sometimes it’s not the ingredients that count, it’s how you mix them together and cook them. Based on what I saw after reading #1, this is well done so far. McMillian’s dialogue work comes across as naturalistic, although there is a fair amount of infodumping (unsurprising, this is a first issue after all), and he does a credible imitation of other miners in this vein. Be that as it may, it’s fairly obvious that this was conceived with one eye on TV or movie development, and it would probably work in that medium. The art is flummoxing me as well; overall it’s pretty good but it’s making it hard for me to play “spot the influence”- I’m reminded of European artists, but there’s a touch of anime influence (the guys look like they could have stepped out of Cowboy Bebop) in there too; people like Paul Pope or Jill Thompson or the cat that draws Freakangels for Ellis whose name escapes me right now; Tim Sale’s style is apparent in the females, especially. It’s as much of a hodgepodge of stuff as the script is. Wieszczyk isn’t as accomplished as those artists, not yet, but she does a good job for the most part- the figures are appealing, distorted but not repulsive or awkward/stiff, and the action scenes flow smoothly. She brings a great deal of imagination to the seance scene towards the end of the story. I think this series bears watching, be it in printed form or onscreen. 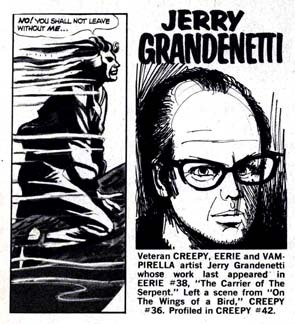 Also, I’d like to note the passing in February of illustrator Jerry Grandenetti, who had a long and distinguished career with a number of different publishers, including DC and Warren Magazines, and as an assistant under Will Eisner in the 40’s. I first came across his work as a grade schooler, reading issues of Warren’s Creepy and Eerie, and out of all the excellent artists (Crandall, Wood, Ditko, Adams, Toth, Colan etc.) represented therein, it was Grandenetti’s that made the strongest impact on me, and many of those stories he illustrated (some were ghosted for Joe Orlando) remain my favorites to this day. For Warren in the 60’s (as well as a short stint on The Spectre and several House of Mystery stories), he got away from the more realistic Eisner-style look and went nuts, rendering the horror and psychological terror tales in an expressionistic, almost hallucinogenic style, and it was highly distinctive and very effective. For some examples, go here and here…I’m preparing a tribute on my blog, which will appear later this week. He eventually gravitated to the world of advertising (just like Meskin above! ), and after his retirement was taking commissions on his now-vanished website; I wish I could have afforded one. Anyway, thanks for the memories, Mr. Grandenetti, and rest in peace. The All-Purpose Review Writing Music List: Flaming Lips- The Soft Bulletin; Roger McGuinn- Peace on You; Kansas- Audio-Visions; OutKast- Stankonia; Wet Willie- Wet Willie; John Lennon- Imagine. Short takes will be back next week, since I’m getting a 17-book shipment from DCBS. Thanks for reading, and hopefully see you then! Review inquiries, mash notes, strictest confidences- johnnybacardi AT gmail.